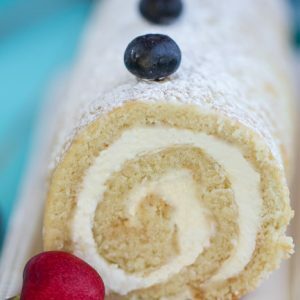 Vanilla Sponge Cake Roll – a simple vanilla cake roll with berries that’s perfect for any summer celebration. It’s filled with a creamy vanilla mascarpone filling and makes an impressive and light dessert. Growing up, my mom wasn’t much of a baker. We didn’t mind though since she would take us to the most amazing baking every Saturday and let my brothers and I pick out any one thing we wanted. We would take our time combing through the display glasses and oohing and aahing over what we should choose. My eyes always led me back to the beautiful cake rolls behind the display. Cake rolls have been on my baking bucket list for the longest time. I’ve always been too afraid and thought they were really hard to make. I finally worked up the nerve to make one back in June for this summer afternoon tea party we threw for KitchenAid. 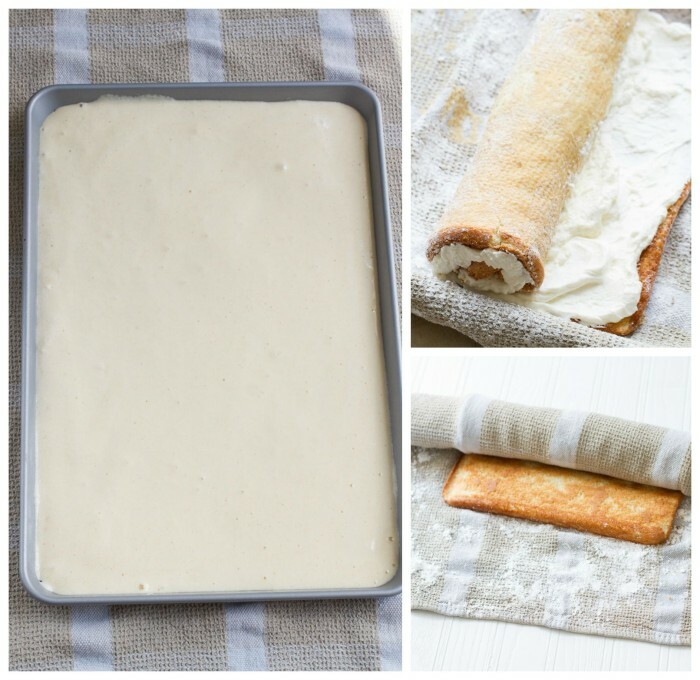 If you’ve never made a cake roll before, you should totally try at least once. You can totally do it if I can! It’s just a matter of mixing, pouring, cooling and rolling. And aah yes – the clean up. There’s some planning involved and then it goes something like: mixing, pouring, cooling and rolling. And aah yes – the clean up. After you mix the batter, spread evenly into a jelly roll pan. Ideally you want a 10 x 15 baking pan that you line with parchment paper with a misting of baking spray. Once the cake is done baking, invert it onto a kitchen towel that has been sprinkled with some powdered sugar. As long as you don’t over bake your roll and remember to roll it up while it’s still hot from the pan, everything will work out just fine. Once the cake has cooled to room temperature, you just carefully unroll it. Spread an even layer of the dreamy vanilla mascarpone cream filling and roll it back up to chill in the fridge for at least an hour. This cake is light, tender and almost melts in your mouth. And the creamy vanilla mascarpone filling with chopped strawberries is what makes this cake extra special. To finish the cake, dust the top with some powdered sugar. Serve with some fresh fruit or glam it up with your favorite frosting and sprinkles. It makes an impressive lighter dessert that is perfect for a shower, special occasion or any summer party. Preheat oven to 375 degrees. Line a 15x10x1 baking sheet with parchment paper. Spray with baking spray (or grease and flour). Set aside. Sprinkle powdered sugar onto a large, clean dish towel (same size or bigger than baking sheet). Set aside. Beat egg whites in a large bowl until frothy, gradually add 1/4 cup granulated sugar, beating until stiff peaks form. In a large mixing bowl beat egg yolks and eggs for 2-3 minutes. Add sugar, water, and vanilla and beat an additional minute until fully incorporated. Sift in flour, baking powder, and salt and turn the mixer to low until just combined. Gently fold in egg whites. Pour into prepared baking sheet. Bake in preheated oven for 9-12 minutes or until the cake is golden or springs back when gently pressed in the center. Make sure to keep a close eye on it after 7 minutes so it does not overcook. Remove from oven carefully with oven mitts or towels and immediately flip cake onto the prepared powdered sugar towel. (This will cause the powdered sugar to splash everywhere - this is normal) Peel off parchment paper. Place a clean sheet of parchment paper over the back of cake and roll cake up in towel carefully (from short end to short end). Cool for one hour. To make filling In a cold mixing bowl, whip the heavy cream with an electric mixer until soft peaks form. Add powdered sugar and continue beating until stiff peaks form. In another bowl using a rubber spatula, beat Mascarpone cheese with vanilla until smooth. Fold in whipped cream until smooth and combined. Set aside in the fridge until ready to assemble. To assemble: When cake is cooled, unroll gently. Remove parchment paper and spread filling in the cake. Sprinkle chopped strawberries. Re-roll the cake tightly without the towel. Refrigerate cake on a plate with plastic wrap over the top. When ready to serve, remove plastic wrap and sprinkle with powdered sugar and top with fresh berries. This cake is best served within 1-2 days. It sounds like cake rolls have a special meaning for you, Kelly! This looks absolutely gorgeous! I love the pretty swirls and vanilla flavor. I think this would definitely be my favorite dessert. Love this! You and my dad share a love of these cake rolls. He ALWAYS wants to buy one when we are at an Asian bakery. I also have yet to gain the confidence to make one of these myself. Good tip about rolling while it’s still hot and using a towel topped with powdered sugar. I hope to try making one of these soon! I love the tip that you gave, to roll the cake in a towel while still hot, now I am less scared to try to make a roll cake, since my previous one broke 🙁 but again, frosting fixed everything! I love swiss roll cakes! They’re so moist and melt-in-your-mouth good. Your vanilla sponge cake version looks absolutely perfect! I love that you did a mascarpone filling – so decadent. Also great tip about rolling the cake when it’s warm…I find that’s the key with these beauties too! Gorgeous cake..wish I was there at the party! What a great story (I love love LOVE that your mom surpirsed you! ), and what a beautiful cake roll! Boy, that turned out perfectly! Roll cakes are on my list of things to try. This is such a beauty. Great job, Kelly!! How sweet is your mom? Mom’s are the best and know how to make our days! 🙂 I’ve always been afraid to make a cake roll too. Hence the reason I haven’t made one yet. 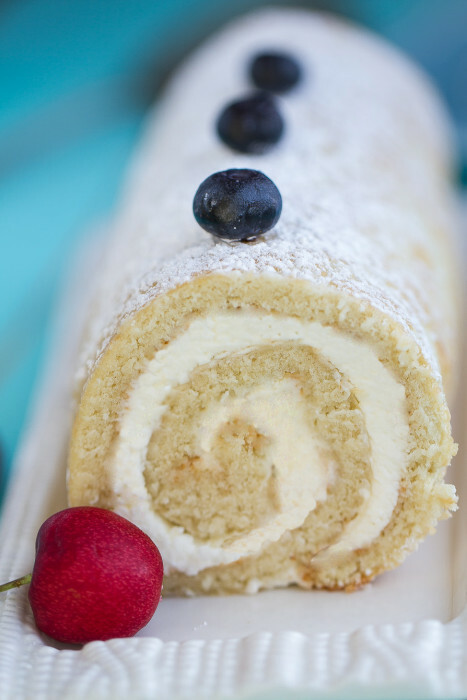 This sponge cake roll looks delicious and I’m loving that mascarpone cheese filling! Pinned! I love roll cakes Kelly, and your look perfect! 🙂 I wish I could have a slice with my coffee right now! Sometimes parents just have the best surprises up their sleeves! I remember coming home to a scooter on the last day of school when I was the same age, it was for me and my siblings and was super special! 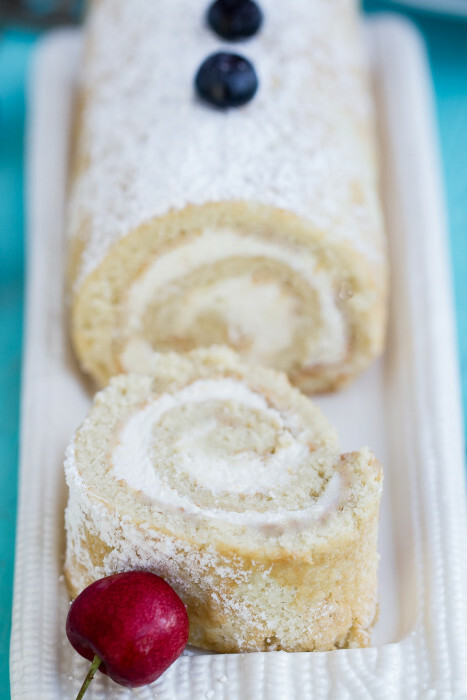 This cake roll looks delicious and the bakeware too! Oh my gosh, your parents are the sweetest! Love that they got you guys a scooter – so so cool 🙂 Thanks Katy! Oh I have ALWAYS wanted to master the sponge cake roll. Yours is PERFECT Kelly! I will have to try your recipe!!! Kelly, you make very beautiful cakes, my friend. This one is no exception! looks gorgeous. I’m ridiculously impressed! I’ve attempted one cake roll and let’s just say it was my last! Yours looks amazing! This looks so amazing! What a pretty cake roll!!! Interesting that you roll it while hot, then let it cool, then unroll it to fill it with filling! Why is that? Also, I love these type of cakes at the Asian bakery :). Love this, great for summer! Can you believe I have yet to make a roll cake?! Yours always looks so pretty and you make it sounds so easy but I’m afraid to do it. I know how you feel, this was my first roll cake too. The clean up is the hardest part – you can’t avoid the powdered sugar which gets everywhere but it is totally worth it 🙂 Thanks Jen, hope you’re having a great weekend so far! Aw sitting here with the biggest smile on my face! That story is so sweet Kelly, mommas are the best 🙂 And this cake is so pretty! The berry accents and cool whipped cream and sponge cake … mercy, the best of every world! Pinned! Aaw so glad you liked it! Moms really are the best 🙂 Thanks for the sweet words and for pinning Mary Frances! Hope you have a wonderful rest of the weekend! I’ve only ever made the pumpkin cake roll from Libby’s and it’s super easy. I love your vanilla sponge cake mascarpone combo! I clearly need this in my life right now! Yum, a pumpkin cake roll sounds sooo good! :) Thanks Rachelle! 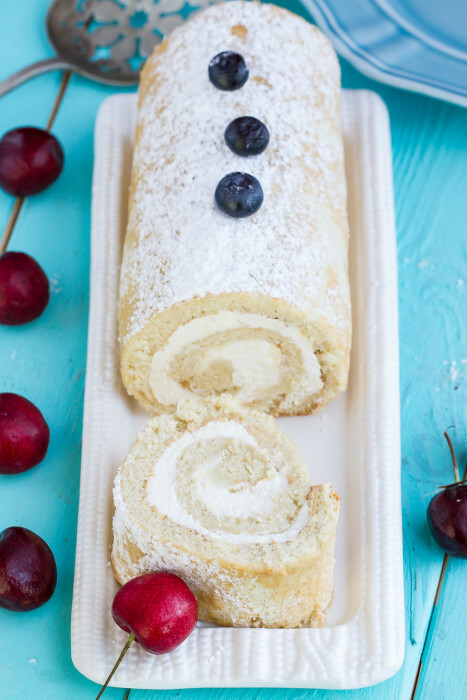 This sponge cake roll looks beautiful! Love the delicate flavour from the vanilla. So perfect for an afternoon tea party! Love this, pinning the recipe! Thanks for sharing, Kelly! Thanks Jess and for pinning! Vanilla baked goods like this are my absolute favorite! This came out so pretty Kelly!! And what a fun memory from when you were a kid – made me smile! They’re my favorite too:) Thanks Ashley! Kelly, I LUV you so much… but your site is torture. I always leave here SO.HUNGRY! 😉 Your story about when you were younger and coveting the cake rolls is seriously SO cute! I can just imagine a little you, staring all wide eye’d at the cake rolls in the back of the case! 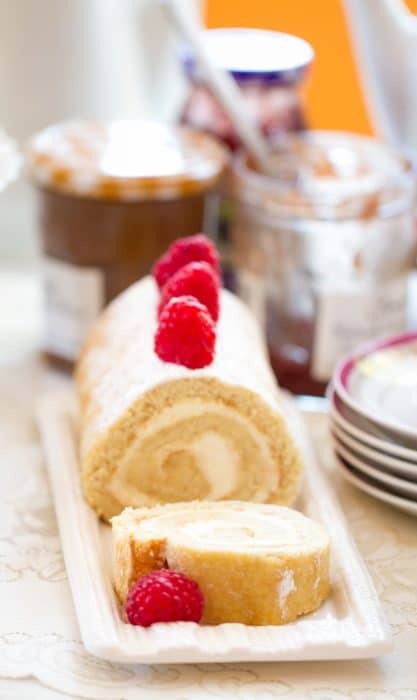 Anyways, your vanilla sponge cake roll looks FABULOUS! Super light, fluffy and 100% seriously DELICIOUS! Your photography is always so on point, and I feel like I can almost taste this! (<–torture!) Pinned! Most definitely making this! <3 Cheers, girl! Hahaha aaw you’re the sweetest, thanks girl! Have a great rest of the weekend! That was such a sweet story Kelly! I love food that brings back such special memories like that. This cake roll looks fantastic and I love the tips and tutorial! What a beautiful story, Kelly! I love all your cakes, Kelly! And this one also looks so adorable and delicious! This absolutely stunning! Drooling! Such a beautiful story.. Parents are full of surprises.. Aren’t they?!! 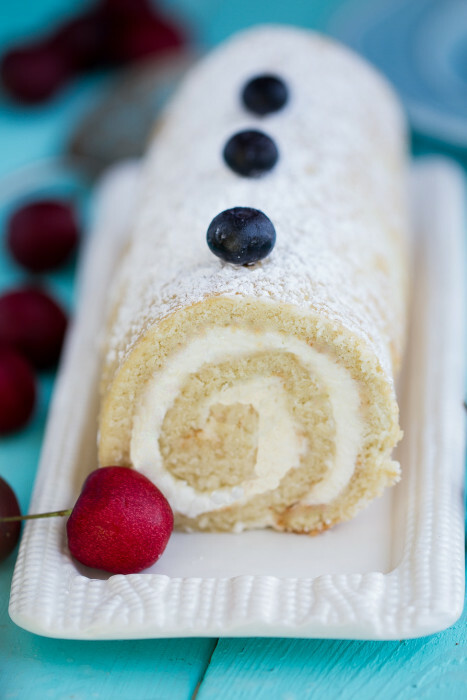 I absolutely adore vanilla sponge cake.. and this sponge cake roll looks impeccable, Kelly!! What a lovely story. Also, great tip on the rolling. I have tried this type of cake a couple of times before and it has always failed. Yours looks perfect though! What a sweet story!! I love cake rolls, this one is beautiful! Such a sweet childhood memory. Your roll looks perfect!! Thanks Jacquee! Loved your beautiful Swiss roll too! I made this for the first time this Christmas and the guests loved it. This recipe is going to be my go to recipe for dessert. The cake was light and fluffy, just like you promised. Thanks so much for sharing it! (Long post, sorry!) Okay, let me just say that I am hardly a baker. My grandma taught me when I was young, but I haven’t had a reason to bake in years, and if I just did it for fun….I would end up with a whole cake to myself. With a history of binge eating, this was not a very good option. However, now that I have a healthier relationship with food, and paired with the onslaught of baking shows I’ve been watching on Netflix, I couldn’t help myself. I had to bake something. I wanted to do something I’d never tried before to see if I could do it or if I would fail miserably…and that’s how I found this recipe. As someone who has never beaten eggs beyond getting to the point of scrambled eggs, I totally underestimated how long it would actually take. I should have brought out the stand mixer, but I thought the hand mixer was fine. I fully expect to be sore tomorrow. lol! That being said, I was surprised that I got the eggs to (what I think was) the right consistency, and it was basically magic to me how fluffed up and huge the batter got! I was so afraid that the cake would spill over the edges of my baking pan, so I laid down some tinfoil on the rack below. Turns out i didn’t need to – it rose juuuuust enough, cooked uniformly, and got juuust a bit of golden around the edges. Whew! I forgot to buy parchment paper, so I was working with just baking spray. the cake came off beautifully, all in one piece. The powdered sugar went everywhere, as expected, but I’m so happy you warned me about it so I could clear off my countertop first. Easy clean up! I rolled up the cake nicely – it cracked a little bit here or there, but overall went really well! Unrolling went nicely to fill the cake, and rerolling ALSO went really nicely! Woohoo!! I was so so proud of myself for being able to get this far. My buttercream turned out as it was supposed to, and my frosting/icing skills were better than I remembered. Not bad for years and years away from it all! The cake itself was light and delicious!